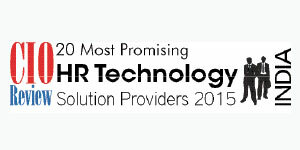 We present to you CIOReviewindia 20 Most Promising HR Technology Solution Providers-2015. Eilisys Technologies A provider of an Human Capital Management Solution which has centralized database to enable HR managers and employees to perform various office tasks. G-Cube A provider of Learning Management System and e-learning solutions which isinfluenced by pay-per-use model. Greytip Software A provider of HR software solutions for employee information management, leave and attendance management, training, appraisals and compensation etc. HR CUBE A provider of HR outsourcing service to enterprises, students and professionals from various industry. HR-One A provider of a state-of-the-art and intitutive HRMS which automates the entire HR cycle of an organization. Netcomm Labs A provider of customizable automation tool which brings transparency to the entire process of HR office functions. PeopleWorks PeopleWorks is a cloud-based Human Capital Management Software automating employee management benefiting both employees and the organization. Sensys Technologies A provider of taxation and HRM related software for TDS, Payroll, Web Fixed Asset, Service Tax, Income Tax, Digital Signature, Databackup & Attendance Machine. Spine Technologies A provider of Payroll software and fixed assets software along with Internet solutions. TalentBurst A provider of Staffing Solutions, Managed Services Provider (MSP) and Vendor Management System (VMS) Solutions.